Eleesha is a young and upcoming spiritual author who is gradually gaining popularity globally. The two famous books authored by Eleesha are The Soul Whisperer and The Soulful Pathway to Quotes. Immensely popular for her motivational, uplifting, and positive quotes, Eleesha is gifted with powerful insight, soul inspiration and empowering reflections. This ingenious and spiritually evolved author has transcribed well over 9000 quotes, affirmations, inspirational passages and handwritten journals. She strongly believes that in order for people to achieve their hopes and dreams it is of utmost importance that they truly believe that their dreams will be achieved and not have the slightest amount of doubt. 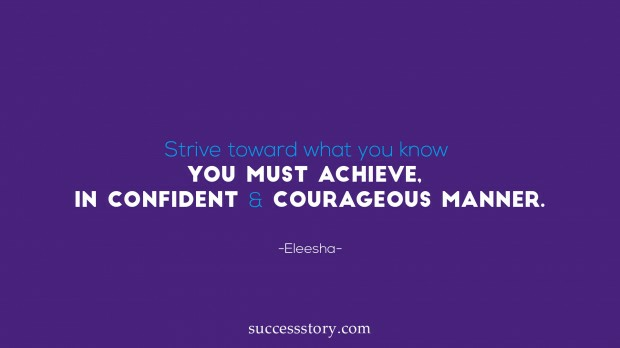 "Strive toward what you know you must achieve, in confident & courageous"